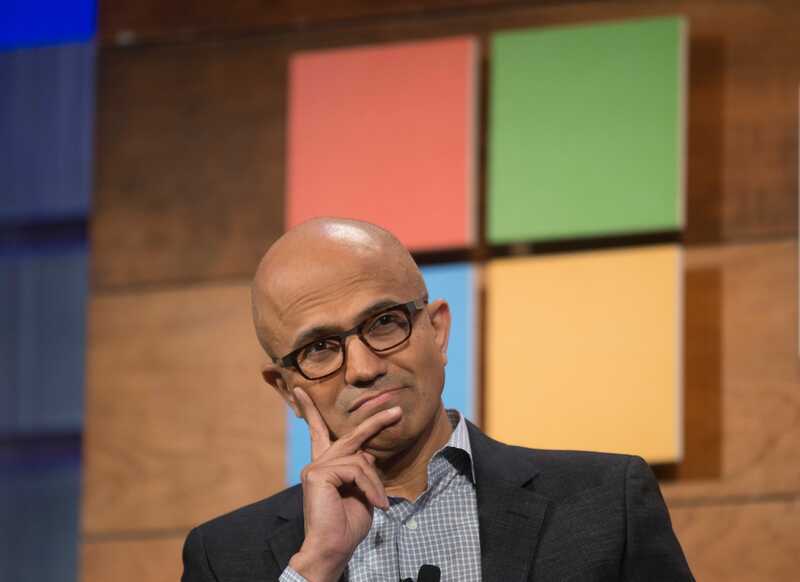 Getty ImagesSatya Nadella, the CEO of Microsoft. Microsoft’s fiscal first-quarter earnings, which it reported Wednesday, beat analysts’ expectations. The company saw strong growth from many of its businesses and product lines, including gaming. Azure, its cloud-computing service, grew at a 76% clip in the period. Though impressive, that rate was the slowest in at least two years and represented a significant drop from the pace in the company’s fourth quarter. Microsoft on Wednesday reported fiscal first-quarter results that topped Wall Street’s expectations, despite a marked slowdown in sales growth from its Azure cloud-computing service. It also offered a forecast that was basically inline with analysts’ projections. The company’s results were boosted by strong double-digit growth from many of its core products, including its Office 365 productivity suite, LinkedIn, and its gaming division. The company’s gaming sales, for example, grew by 44% from the same period last year. Indeed, all the major portions of the company’s business posted sales that surpassed the Street’s forecasts, said Daniel Ives, a financial analyst who covers Microsoft for Wedbush. Analysts initially cheered the news, sending Microsoft’s stock up as much as 5% in after-hours trading before tempering their enthusiasm. In recent exchanges, its shares were up $US1.88, or 1.8%, to $US104.20. Fiscal Q1 revenue: $US29.1 billion, up 19% year over year and above the average analyst expectation of $US27.92 billion. Fiscal Q1 earnings per share: $US1.14. Wall Street was expecting $US0.95 a share. In its first quarter last year, the company earned $US0.84 a share. Fiscal Q2 revenue (outlook): Between $US31.9 and $US32.7 billion. Prior to the company’s report, analysts had forecast sales of $US32.26 billion. During last year’s holiday quarter, Microsoft brought in sales of $US25.83 billion. Fiscal Q2 EPS: Microsoft didn’t give specific earnings guidance. But its forecast for its revenue and expenses implies earnings of around $US1.02 to $US1.14 a share, assuming its share count stays the same and its effective tax rate is about 18%. Wall Street had previously predicted earnings of $US1.07 per share. In its second quarter last year, Microsoft lost $US0.82 a share as it took a $US13.8 billion charge related to the new federal tax law. The company’s stock closed regular trading down $US5.78 a share, or 5.4%, to $US102.32. All three of Microsoft’s major business segments posted double-digit sales growth in the quarter. Its “intelligent cloud” business, which includes Azure, set the pace, with 23.8% growth over the year-ago quarter. Its “productivity and business processes” group, which includes its Office products, grew at an 18.6% pace. And its “more personal computing” group, which includes Windows and its gaming products, saw sales go up 14.6%. Among the products that helped drive the results were the commercial version of Office 365, which saw its sales grow at a 36% pace; LinkedIn, at 33%; and Xbox software and services, at 36%. Though the company’s overall results exceeded expectations, they included some disappointments. Most notably, revenue from the company’s Azure cloud-computing service grew at a 76% annual rate. That might seem like nothing to sniff at, but it represented a significant slowdown from the 89% pace in the company’s fourth quarter and was lower than many analysts were expecting. It was also the slowest growth rate for Azure in at least two years. However, that pace was in line with what Microsoft was expecting, Mike Spencer, the company’s general manager of investor relations, told Business Insider. It had forecast that Azure’s growth would decelerate, and that slowdown is due to the law of large numbers, not to any problems with the business, he said. The company’s cloud and server products, of which Azure is one part, grew at a 28% annual pace overall in the quarter, he noted. “We actually feel good” about that growth, he said. Microsoft also saw a significant slowdown in revenue from its Dynamics 365 product line, which represents the cloud versions of its customer-relationship-management and enterprise-resource-planning software. That business grew at a 51% clip in the first quarter, down from 61% in the fourth quarter. As with its Office productivity suite, Microsoft is trying to move customers who had purchased periodic licenses for its Dynamics software to the new cloud versions, which it offers as a subscription service. So even as the Dynamics 365 business is growing, its traditional Dynamics business is shrinking. All told, if you include Microsoft’s traditional, non-cloud versions of its Dynamic products, its Dynamics business grew at a 20% annual rate. That’s “a really strong number,” Spencer said.